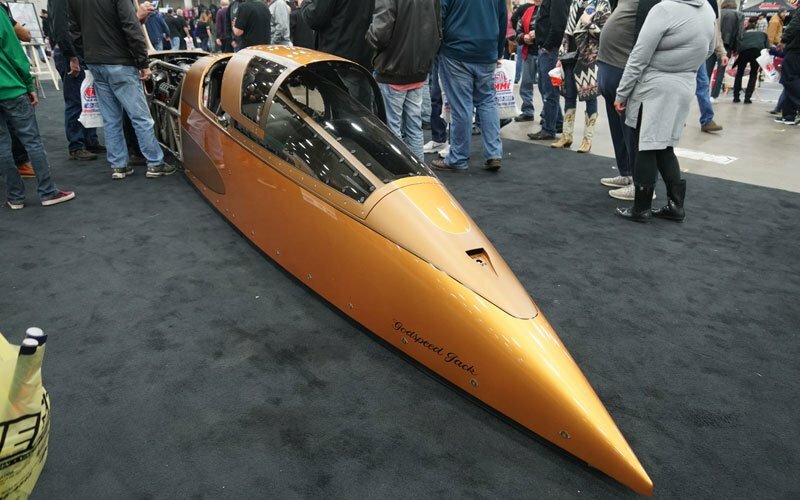 Hot rodding patron and land speed racer George Poteet and Speed Demon appeared together at the 2018 Detroit Autorama this year. Poteet, a well known hot rod builder and collector, said he was just there to take in the atmosphere at the world’s most pretigious hot rod show in the country. He brought with him his world famous Bonneville Salt Flats racer known as the Speed Demon. It was in the Speed Demon that Poteet posted the fastest time on record for a piston powered vehicle, reaching 462.345 miles per hour on September 20, 2011. Last year, on August 16, 2017 he once again reached 453.876, matchiing another run of 453 + from 2012. Suffice it to say that whenever George Poteet and Speed Demon hit the flats, there is the potential for a new world record to be set. “My intention is to hit 475,” Poteet told us. The Memphis millionaire is a hero to the Baby Boomer generation and to this day he runs Bonneville every year. His famous crash in 2014 is well documented on You Tube. He was doing 375 miles an hour at the time when he got sideways and airborn. In the past, one of Poteet’s Fords, a 1937 Ford Roadster, won the Ridler Award in 1997. Cars-On-Line readers will remember when we covered the Detroit Autorama in 2017 and one of Poteet’s cars, the GTP 1932 Ford Tudor Sedan, made the Great 8 that year. (Click here to read the full page article we did on the Great 8 Award winning ’32 sedan.) Johnson’s Hot Rod Shop built that one for him. A few years earlier, in 2013, our readers may remember when we covered Hot August Nights in Reno, Nevada, and Poteet’s 1969 Ford Torino Talladega GPT Special won the Barrett-Jackson Cup that year. (Here is a link to our 2013 Hot August Nights coverage.) It was built by Troy Trepanier at his shop in Illinois. That car also took the Goodguys Street Machine of the Year award that year. Poteet is known to have the largest collections of hot rod Fords in the country. He has a propensity for 1932 Ford hot rods especially.